There’s not a lot to say here except that this will be the best chocolate cake you ever bake. Ever. It has stood the test of time, fads, and the convenience of box cake mixes. 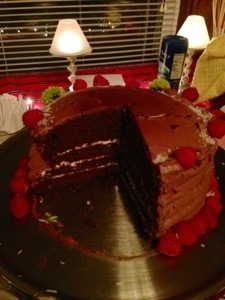 This chocolate cake recipe first appeared in The Christian Science Monitor in the 1930s or ’40s. It was reintroduced to readers a few years ago in this essay. When my mom gave me cake tools for Christmas this year, an eight-layer cakemaker complete with a plastic wand with interchangeable parts for carving pretty patterns in the icing, I decided to put them to the test for Gretchen’s New Year’s Eve birthday bash. I don’t think I’ve even made a double-layer cake before this. I’m only sorry I didn’t take better pictures. But all my concentration was put into creating this masterpiece, so I just snapped a few pictures with my iPhone. I layered the cake with alternating buttercream frosting and raspberry preserves that I heated in the microwave for about 10 seconds to get it to a spreadable texture. 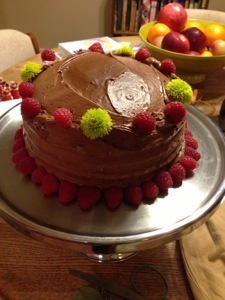 I covered the sides and top with a chocolate butter cream frosting. I adapted the frosting recipe a bit from the original recipe, made it less sweet, which I think works just fine – because this is a really moist, dense cake. It’s delicious either as a simple sheet cake or dressed up into a multi-layer celebration cake. There was just enough to give our revelers a nice big piece each – and left the Birthday Girl with a giant piece to eat the next day, which she did for breakfast. While sweet endings are nice, sweet beginnings are even better. Preheat oven to 350 degrees F. Grease and flour a 9- x 13-inch pan or two 9-inch round cake pans. If you are using round pans, it is recommend that you cut out a piece of parchment paper and line each pan, since this cake tends to stick. Place butter and sugar in a large mixing bowl. Add boiling water and stir until the butter and sugar are dissolved. Sift the dry ingredients into the batter and combine. Add eggs and vanilla extract and mix well. Pour into prepared pan(s) and bake about 35 minutes, or until a knife inserted in the center comes out clean. Note: Homecooks who have used this recipe find that the cake rises higher in the middle. Cream butter until fluffy, gradually add powdered sugar. Stir in milk, 1 teaspoon at a time, until you achieve the consistency you want. Add vanilla. This is a thick, rich icing. Sift the dry ingredients (flour, cocoa, soda, salt) into the batter. Mix well. Add eggs and vanilla and mix until well combined. In the top of a double boiler, melt the chocolate completely. Remove from heat, allow to cool. Cream butter until fluffy, gradually add powdered sugar. Beat in egg yolks, one at a time. Add in chocolate, beat until desired consistency. Can’t wait to try this one! Hopefully tonight for dinner with our good friend Lindsay. Thanks for introducing this one, Kendra. That is a beautiful cake! I’m impressed! Looks delicious. I hope to try making this one someday. You made it sound scrumptious. Wow!